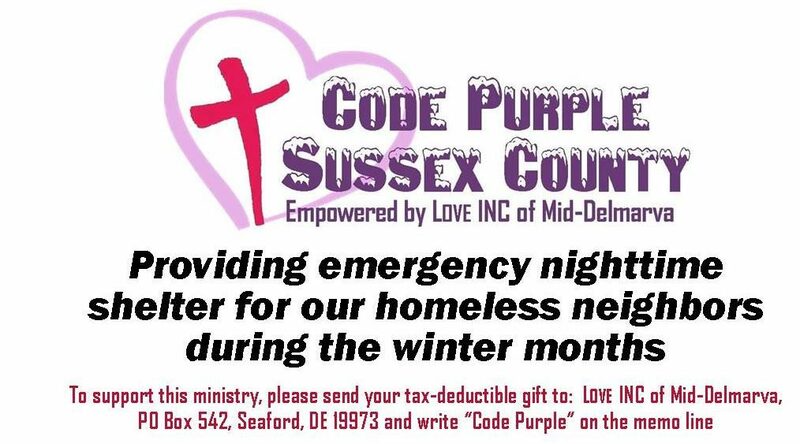 Code Purple Sussex County will begin Monday night! Unfortunately, we do not have enough overnight volunteers to cover all the nights. That’s the main reason that we haven’t opened any earlier than when the online calendar starts. PLEASE consider giving a bit of your time to help at one of our shelters. Remember the buddy challenge, if you want to have a friend stay with you then you won’t have to stay alone. Anyone who went to a training, please go and sign up for the night that you specified on your volunteer forms. We don’t have a volunteer coordinator so that would be very helpful to us. If you did not make it to a training, then we will train you on the job. Just fill out this form Online Volunteer Form and it will be emailed directly to us. Then go to our Volunteer Site Calendars and fill in the days that you would like to volunteer! Contact us via email at codepurplesussexcounty@gmail.com if you have any questions. Previous PostFinal Days Til Opening!Next PostLimited Opening Monday 11/26/18 through Thursday 11/29/18!